Spiral Notebook with PP Cover. 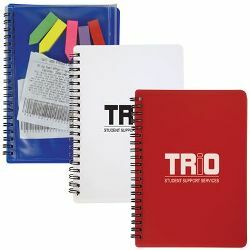 Recycled 70 page lined paper double spiral binders. Clear PVC pouch with slide zipper on back. ITEM SIZE(MM) 135L x 185H x 15D. PRINT AREA(MM) 60L x 80H.